Born in 1972, education – higher. In 2005 he graduated from Atyrau Oil and Gas Institute in major “Oil-Gas Field Development”. His labor activity started from the position of Oil Well and Equipment Repairman in “Tengiz Munai Neft” within 1990-1998. Within 1999-2003 worked as Oil Loading Terminal Operator, Oil Treatment Plant Operator, Oil Treatment Plant Foreman in “Sazankurak” JV JSC (FIOK). Within 2003-2004 worked as Oil and Gas Recovery Foreman in “Prikaspian Petroleum Company” (FIOK). Within 2004-2006 worked as Field Manager in “Sagiz Petroleum Company” (FIOK). In 2006 was hired to the position of Leading Production Engineer in “Ecogeoneftegaz” LLP. In 2008 transferred to the position of Deputy Production Director. Since 2009 worked as Head of Production and Technical Department of “Tandai Petroleum” LLP. Within 2010-2012 held the position of Director General. 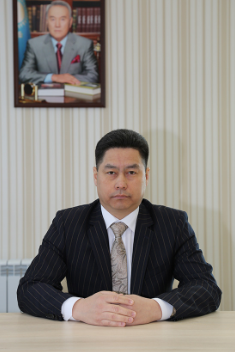 Within 2012-2015 held the position of Director General of “RusBurMash-Kazakhstan” JV JSC, Almaty.